Ostrich fillet is a truly South African (and healthy alternative) for the braai this festive season. The latest NutritionConfidence recipe from Vanessa Marx (Dear Me) combines this South African speciality with the gorgeous Spinach, Beetroot & Pomegranate salad we posted a few days ago. The raita bursts with flavour while being low in sugar and fat. Ostrich meat is a great alternative to other ‘red meat’ sources. Classified as a ‘white meat’ due to its fat content, it’s low in fat (even lower than some chicken cuts) and saturated fat; but also a good source of biologically available iron. A tip from the chef: Ostrich fillet is best cooked on a high heat for a shorter period. This recipe cooking time would result in a medium rare steak, depending on the thickness of the steak. For a rarer steak, cook for one minute less on each side. – Put a griddle pan on a very high heat. 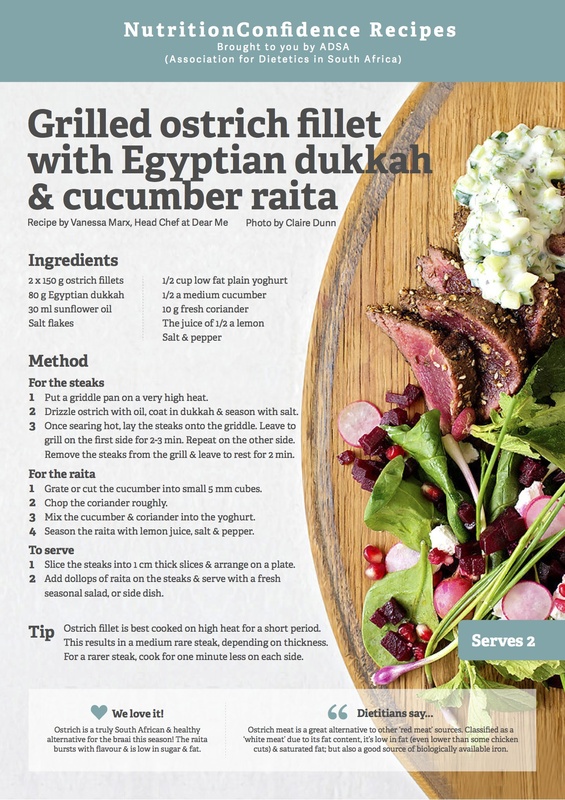 – Drizzle the ostrich steaks with oil and coat in the dukkah. Season with salt flakes. – Once the griddle pan is searing hot, lay the steaks onto the griddle. Do not move them around, leave them to grill on the first side for around 2-3 minutes. Turn the steak over and grill on the other side for a further 2-3 minutes. Remove the steaks from the grill and leave to rest for 2 min on a cutting board. – Cut the cucumber into small cubes about 5mm, or for a time-saving method, grate. – Chop the coriander roughly. – Mix the cucumber and coriander into the yoghurt. – Season the raita with lemon juice, salt and pepper. – Slice the steaks into 1cm thick slices and arrange on a plate or serving platter. – Add dollops of raita on top of the steaks, and serve with a fresh seasonal salad, or side dish of your choice. This entry was posted in Recipes and tagged healthy food, healthy lifestyle, nutrition, ostrich, raita, Vanessa Marx. Bookmark the permalink.